Have you added closed captions to your eLearning lesson and been frustrated by the fact that they do not automatically open when the learner first accesses the lesson? Read on for a quick way to solve the problem. 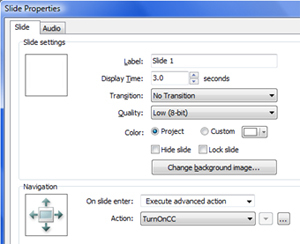 Captivate 4 and 5 both come with a variable called cpCmdCC. The variable may be set to 1, to turn the closed caption display on; or 0 to turn the closed caption display off. 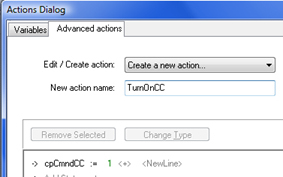 Create a Standard Advanced Action (Project > Advanced Actions) as shown below. You can do the same thing as above, but the Captivate 4 interface is a tad different than version 5. Below are the screen shots for the Action and attaching the action to the slide On slide enter. Note: If you follow only the steps above, the CC field will be displayed, but it may not display correctly. Insert a blank slide before Slide 1. Set the timing of the new slide to 0.1 seconds. The learner will never notice the extra slide but the closed captions will be on automatically and should be displayed properly. About the author: Lori Smith is IconLogic's lead programmer and Adobe Certified Expert (ACE) in Adobe Captivate. She teaches IconLogic's Advanced Actions class.